My husband gets poison ivy very easily and we have yet to find anything to get rid of it other than prescription drugs. I am excited for him to try this soap this year at the first onset of Poison Ivy to see if we can prevent having to put his body through the prescription again. He has had systemic poison ivy and is now very allergic to it. 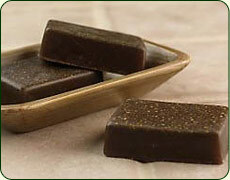 With it being early spring we have not tried this soap yet, and I hope for his benefit we never have to! The Native American Indians were puzzled about the cause of the rash many European visitors were getting. This is because they cooked, dyed clothes and decorated with Poison Ivy/Oak branches and leaves. Poison Ivy/Oak is not toxic or poisonous but the oil contained in the plant has the ability to penetrate the 5 to 8 layers of the skin and bind with our natural body fluids causing a severe histamine reaction. All of the itching, weeping, swelling and pain are from our own body’s defense system working to get this oil out from under the skin. For someone sensitive to the oil, one fifty thousandth of a drop is enough to cause a major reaction. 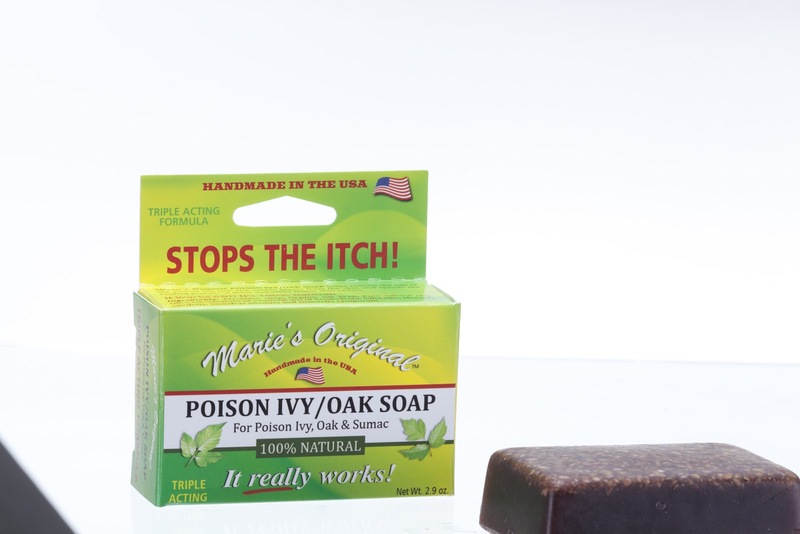 Marie’s Original Poison Ivy/Oak Soap removes the oil from the skin and helps calm down the reaction of the body. 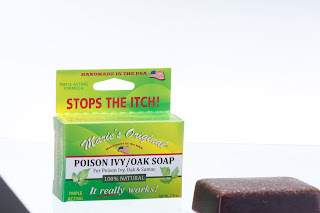 Marie's poison ivy/oak soap helps remove the oils of the poison ivy/oak plant from the skin, and speeds healing of poison ivy/oak and other minor skin rashes. For best results, wet skin with hot water, lather the poison ivy/oak soap and allow it to stay on the skin for a few minutes, then rinse with hot water. Do not use this product on broken skin without consulting a physician. If a rash has already started, it may be necessary to repeat use three or four times a day for a few days. The soap should be applied 3-4 times daily. If rash persists, the soap should be left on for an hour or even longer. It's important not to eat or drink stimulating foods or beverages while the poison ivy is running its course; i.e., items with caffeine or hot spices. Everyone reacts slightly differently to poison ivy and oak. Marie's Original is giving one of my readers 2 bars of soap during the Green Spring Clean event!! Just in case you are outside doing some spring cleaning and get into this itchy plant! I was given 2 bars of soap in exchange for an honest review. This would be great to have on hand - we live in the middle of a National Forest! I have never had contact with poison ivy, but this would be great to have on hand when we go camping! My husband works outside landscaping and occasionally comes home with poson ivy. This may help. This would be great for my BIL and my dad cause they are always getting it when cutting wood . We very seldom get poison ivy. But sometimes if my boyfriend goes fishing he gets it. So this would come in handy! I know I'm going to need this for my two boys!!!! Or myself lol. Thanks for the review! Great product to have on hand. Friends have had severe cases of poison ivy not that long ago. I would love to have some of this soap on hand to use even if I suspected I had come in contact. We do a lot of hiking and camping. I am so allergic to poison ivy that if I just touch someone's shirt after they brush against it, I have a severe breakout! This would be very handy to keep on hand! I can't remember the spray stuff we use for poison ivy. We have like 6 bottles of it because of J's grandpa. J doesn't react to poison ivy OR poison oak. Lucky dog. I've never had to deal with poison ivy before (lived in Arizona,) but now we live in Maryland and there is some in the woods adjacent to my backyard. This soap would be great to have on hand if needed. I have a serious allergic reaction to poison ivy, and my backyard is full of it! This would be awesome to have. It's been awhile since I have had poison ivy, but my kids seem to get it every year. This is a great soap. Love the idea! We love camping and it's inevitable that someone isn't watching where they're going and walks right through it. This would come very handy for my husband!